7 oz. A new breed of natural smoked salt, this Pacific Sea Salt is slow smoked over real alderwood, giving its it’s authentic, clean smoke flavor. Salish™ smoked sea salt is a 100 % natural way to add authentic smoked flavor with no strange aftertaste. No liquid smoke, artificial flavors or coloring are added. 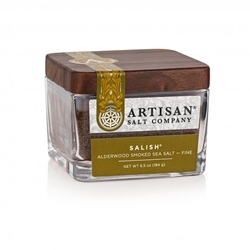 Salish Smoked Sea Salt combines traditional Alderwood flavor with sea salt to create a most unique and beautiful spice to use in any of your favorite recipes, both on and off the BBQ. Once referring to the Puget Sound, the name Salish™ comes from the Native American Indians- the first to inhabit the great Pacific Northwest. In fact, Northwest Red Alderwood has been used to smoke salmon and other meats for hundreds and hundreds of years, making it a true Northwest tradition.